The Office of Diversity and Inclusion (ODI) has created a unique event that brings together successful and aspiring black business men and women. For the first time, students and local business owners showcased their talents, services and products in an expo format on Feb. 22. The Black Business Expo served dual purposes: encouraging and bringing together black entrepreneurs, and providing guidance and positive reinforcement for students who are in the initial phases of developing their professional business personas. In preparation for the event, participants were encouraged to attend an informational session held the week before the expo. This session was led by SIU’s Illinois Small Business Development Center, the office that guides small business owners as they establish or expand businesses. The SBDC presentation highlighted ways to utilize space at an expo in order to market one’s product or service in the best manner. It also noted the significance of investing in one’s professional image with items such as business cards and banners. Gabrielle Jeschke, a microbiology sophomore, was one of the SBDC presenters. She is also the owner of Soap Sisters, a business that sells organic soaps. She gave expo participants tips for establishing and maintaining professional communication through the use of follow-up emails and a monthly newsletter. These forms of outreach have the potential to lead to more engaged and loyal customers, Jeschke said. Ten student entrepreneurs and four Carbondale community business affiliates showcased their products and services at the expo, with varied products including jewelry, makeup, nails, shoes, clothing and food. 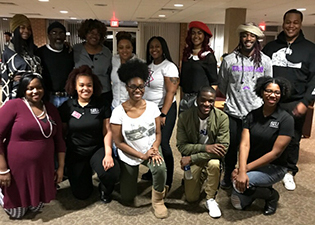 The primary goal of this event, according to Jazlyn Stanciel, a graduate assistant in the ODI pursuing her masters in counseling, was to allow black student and community entrepreneurs to collaborate and connect with each other. The idea was to provide space for those who have achieved success right here in Carbondale to showcase their businesses as they offered encouragement to young black entrepreneurs hoping to do the same thing. Lyndsey Hudson, a junior studying human nutrition and dietetics, showcased her skills as a beautician. She is launching a nail services business but has accumulated a repertoire of other related services including hair, makeup and jewelry. Hudson offers a confident analysis of her future. “Long story short, I’m about to make an empire,” she said. Amira Williams, a social work senior, also participated as a student entrepreneur. She is known in Carbondale for her delicious soul food, which she hopes to one day sell from a food truck. Her specialties include jerk chicken, mac n’ cheese and mashed potatoes. She said she realized a need for traditional soul food in the region and that motivated her to take action. Originally from the north suburbs of Chicago, she missed this type of food while at school and began cooking it often for friends who encouraged her to sell it for a profit. The positive response to her dishes motivated her to keep going and try to obtain that food truck. Carbondale black business people included Earrings by Carolyn, Sweet Escape Candy Shop, Kickaholics and Rahim’s Beauty Supply. They connected at the event and many promised to visit each other’s businesses. They also shared professional advice with student entrepreneurs. “This kind of event provides a platform for black men and women to showcase their businesses to other people and show off all the good work they are doing. Coming together in this way also provides them with a place to discuss tips and share feedback so that they can ultimately be more successful,” Cree Harris, a management senior and student worker in ODI who served as one of the event organizers, said. This event was deemed a success as it accomplished its mission of connecting students with successful entrepreneurs. The secondary benefit was encouraging students to continue pursuing their ambitions and realize that they have role models right in Carbondale.